Whilst trawling through my enormous backlog of pedagogical papers and general mathematical writings in my reading file I came across something I wrote about 3 years ago that came about after a truly inspirational bit of CPD. Inspirational because it angered me. In essence, If you ain’t colour coding your worksheets, you’re not doing differentiation!!! Naturally being the cocksure little maths teacher I was then (as opposed to the bigger cocksure teach I am now of course 😉 ) I returned straight to my desk and sent an email to my department detailing my thoughts on it all… wow! The cheeky little blighter! Anyway, years later and I’ve stumbled on it again, on re-reading I think I had some valid points but I’ll leave it here for you to decide, complete and unedited. p.s. In retrospect I’m actually quite impressed with some of it! Differentiation isn’t about the knowledge in someone’s head; it’s about how well someone can assimilate new knowledge. Differentiation shouldn’t be about having extra worksheets; it should be about how you can use your current resource to stretch the best and how you can aid the weaker via careful questioning and scaffolding. Every student should be able to get something valuable from the current work. To give weaker students easier work is to undermine their confidence. To give more able students ‘harder work’ is to give them a false impression of their ability and may lead to mistakes in the most basic aspects of work. Careful questioning techniques and differentiation go hand in hand. At no point should differentiation be about plugging the gaps in missed knowledge. That is not differentiation. (About a conjecture) is this always true, sometimes or never true. What Maths skills do we need to know in order to help us solve this? Could you represent that in some sort of picture? Does anyone have the same answer but a different way of explaining it? What has changed? / What has stayed the same? Where are the pitfalls/problems/ traps in this question? A simple set of questions with only minor differences between the questions. A weaker student may be asked to answer the questions with the reality being that they only are able to understand the method they are using. A stronger student may be able to make the associations between the signs and the answer that they get. A strong student would be stretched by asking them to add a third term (i.e. (x+2)(x+5)(x+3)) and investigate the rules when only the sign changes. In each case the students will be accessing the same work; no one is excluded from the tasks. The only difference is the end point. 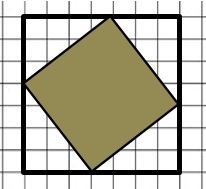 2: What is the area of the shaded square? One such approach that a student of any ability would use may be to split the shape into smaller shapes they recognise then work out the area from that i.e. Other students may choose to find the area of the larger square and then remove the four white triangles around the edge of the shaded square. Each approach provides plenty of challenging mathematics that can be accessed by any ability level. For the weaker students I would ask them to consider drawing their own squares and to test their own method to see if there is a quicker way to solve the task before coming up with a solution to finding any square in words. More able students I would ask to see if they could find an algebraic formula that would work for any condition. This would be a much more challenging task as it involves being able to expand double brackets and manipulate algebra. More advanced students may even realise that what they have discovered is a proof of pythagoras. Ask them to suggest potential lengths and widths it could have. Students are to plot the points onto a graph. Discussion point of asymptotes, negative areas and the idea of infinity, skill level dependant. Extension for those who progress quickly, what if the perimeter is equal to 48m as well. Can you find out the lengths of the sides when the perimeter = area? Further extension, why is the answer to this positive when the graph reflects in y=-x? Extension tasks, what about 1 -200 or 1 – 300… can you find an algebraic formula? Students are given a 100 grid and told to find the factors of the numbers. Students should be told to look for any patterns but not make any generalisations. Students should hopefully draw conclusions about prime numbers, that square numbers have an odd number of factors plus any other observations. The level of the student will dictate what information you are getting. With careful questioning students can be led towards conclusions. 6: How many ways can you stack 6 cubes? Which requires the least floor space? Which requires the largest? What if the boxes are cuboid rather than cubes? Students who are more visual learners could use multilink or Cuisenaire rods. Students could be asked to think about surface area, volume, compound shapes etc. The natural ability of the student will help to differentiate itself providing you ask them the right questions. Remember; differentiation only happens because a teacher has allowed it to happen. It is only through your knowledge of your subject and your students that it can be successful.